A photo from the Syrian Arab News Agency (SANA) showed Syrian pro-regime demonstrators in the Mediterranean port of Tartus. BEIRUT (AP) — Syria has entered a state of civil war with more than 4,000 people dead and an increasing number of soldiers defecting from the army to take up arms against President Bashar Assad’s regime, the UN’s top human rights official said today. Syrian President Bashar Assad has been trying to crush an 8-month-old revolt against his autocratic rule, but the violence has only intensified. The scathing criticism from Pillay comes as the pressure piles on Assad from home and abroad. The European Union today imposed fresh sanctions on Damascus, and the Syrian opposition called a general strike inside the country. The recent spate of economic sanctions from the EU, the Arab League and Turkey are punishing Syria’s ailing economy, a dangerous development for the government in Damascus. Syrian business leaders have long traded political freedoms for economic privileges in the country, where the prosperous merchant classes are key to propping up the regime. The 27-member bloc also imposed some sanctions on Syria’s ally Iran in the wake of an attack this week by a mob on the British Embassy in Tehran, the Iranian capital. The sanctions came as Syrian troops stormed a village in the central province of Hama, killing at least six people — the latest in what has become daily violence and bloodshed in the country. It was difficult to gauge how widely Syrians were abiding by the strike, which activists announced on an opposition Facebook page. The regime has sealed the country off from foreign journalists and prevented independent reporting. Residents in Syria’s two economic powerhouses — the capital, Damascus, and the northern city of Aleppo — reported business as usual today. But in the flashpoint city of Homs, a resident told The Associated Press that most of the shops were closed, except for those selling food. Homs has been one of Syria’s most volatile cities, with increasing clashes between troops and army defectors. ‘‘Few people are in the streets and only about 20 percent of students went to schools and universities,’’ said one resident, who asked that his name not be made public for fear of government reprisals. A video posted online by activists showed mostly closed shops in the Damascus suburb of Zabadani, which also has seen large anti-regime protests. Despite the recent diplomatic squeeze and today’s strike, the government has shown little sign of easing its crackdown. The Local Coordination Committees activist group said security forces swept through the village of Traimseh in the central province of Hama. The group said six people were killed, without giving further details. The British-based Syrian Observatory for Human Rights also said six people were killed and nine wounded in Traimseh. It added that the operation was continuing in the village. The government today also took local journalists on a trip to the village of Kfarbo in Hama province, where they spoke to the family of a 9-year-old boy who was shot dead in Homs three days ago while he was buying cookies from a shop. She blamed ‘‘armed terrorists’’ for killing her son. The shooting is particularly resonant in Syria because the boy, Sari Saoud, was from a Christian family. Christians and other religious minorities in Syria generally support the regime because they feel it offers them important protections. 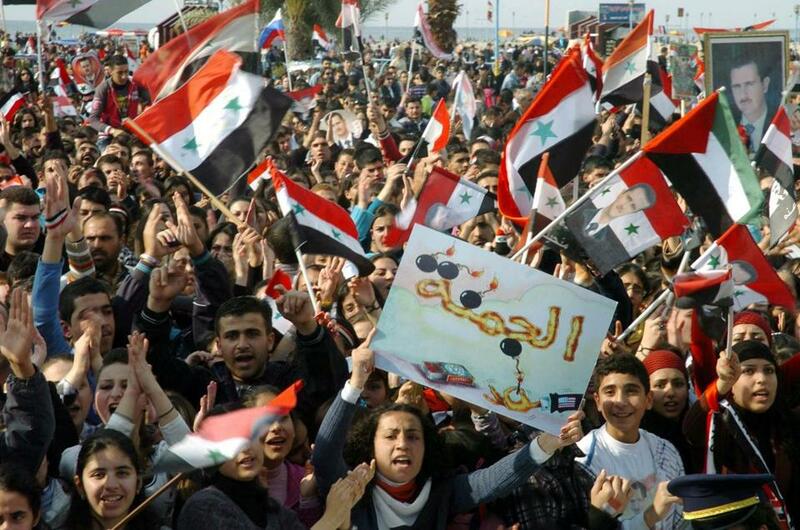 Syria is overwhelmingly Sunni Muslim, and many minorities fear they will be marginalized if a Sunni regime takes over. Assad and the ruling elite are from the tiny Alawite sect. Jordans reported from Geneva. Associated Press writers Albert Aji in Kfarbo, Syria, and Don Melvin and Raf Casert in Brussels contributed to this report.